Python is one of today’s fastest-growing languages. Its simple syntax makes it relatively easy to learn, and its diverse uses…from web and game programming to data analysis and data mining to scientific computing, artificial intelligence, and more!...are fueling its popularity. 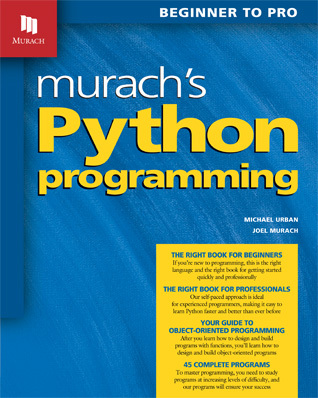 So we’re finally answering the clamor for a Murach book on Python. We believe it provides the fastest and easiest yet most professional way to learn Python that you can find, whether you’re a beginning programmer or have years of experience. This book is for anyone who wants to learn Python. If Python is your first programming language, it helps you master all the skills and concepts you need to program in any modern language, as you learn Python itself. If you’re an experienced programmer who wants to add Python to your resume, it will help you learn Python faster and better than you’ve ever learned a language before. And either way, once you’ve used it for self-training, it becomes your ideal on-the-job reference. Section 1 presents an eight-chapter course in Python that gets you off to a great start. This section works for both beginners and experienced programmers because it lets you set your own pace. If you’re a beginner, you’ll move slowly and do all the exercises. If you have experience, you’ll move more quickly, skimming through material you already know to focus on skills that are new to you or that you’ve never mastered. At the end, you’ll have a strong set of the base skills that you’ll use in any Python program. Section 2 builds on the subset in section 1 to present the additional skills that every Python programmer should master. Here, then, you’ll learn more about working with numbers and strings than what was presented in section 1. And you’ll gain new skills for working with dates and times, dictionaries, recursion, and algorithms. Section 3 consists of three chapters that show how to design and develop object-oriented programs. OOP is critical in today’s world, and if you’re new to the concepts or you’ve always been somewhat mystified by them, Python’s syntax combined with our presentation will make it all clear. The focus of section 4 is to show you how all of the skills that you’ve learned in the first three sections are applied to real-world programs. First, chapter 17 shows you how to use Python for database programming, a must in businesses large and small. Then, chapter 18 shows you how to use Python to develop programs with graphical user interfaces (GUIs). Like all our books, this one has features that you won’t find in competing books. That’s why you’ll learn faster and better with our book than with any other. Here are a few of those features. To show you how Python works, this book presents 45 complete programs that build from the simple to the complex. We believe that studying the code for complete programs is critical to the learning process... and yet you won’t find programs like ours, that tie all your newfound skills together, in other Python books. Like all our books, this one has exercises at the end of each chapter that give you hands-on experience in practicing what you’ve learned. They also encourage you to experiment and to apply what you’ve learned in new ways…just as you’ll have to do on the job. They start from partial programs that provide the boilerplate code, giving you more practice in less time as you focus on the skills you’ve just learned. And they tie a number of skills together instead of having you apply one skill per exercise…an approach that’s much more realistic and satisfying. To develop Python programs, you just need to download and install Python. It includes an integrated development environment (IDE) called IDLE that you can use for coding, testing, and debugging your programs. Chapter 1 shows how to use IDLE, and appendixes A and B show how to install Python and IDLE on Windows and Mac OS X systems. If you’re going to develop programs that use a SQLite database as shown in chapter 17, you also need to download and install DB Browser for SQLite. Appendixes A and B also provide the instructions for doing that. To get a better idea of how well this book works, you can download its first two chapters in PDF format. As you will see, these chapters work well for programming novices as well as experienced programmers. If you’re a beginner, these chapters will help you discover whether you like programming. This chapter is a quick introduction to Python programming and the IDLE interactive environment that’s used for developing Python programs. This chapter presents a starting subset of Python skills that lets you write your first programs. And we’re not talking about a few lines of “Hello World” code, but complete programs that get input, process it, and display output. This chapter works great for beginners, and if you have some programming experience, you’ll speed through it. Appendix A for Windows and appendix B for Mac OS X show how to install and use these files. There is a one page, or sometimes even less than one page explanation, which is completely to the point and gives you what you need to know. It covers the perfect amount of description and it does not make you bored by providing unnecessary details. There is of course the syntax introduction as well, which is followed by some key points in form of bullets about the key points you need to consider when using the syntax. Overall, the structure of the book makes it very easy to follow and makes the learning process so much faster. The book provides graphics and summarization whenever there is a need for more detailed explanation.